Apple consists almost 80% of water, and the remaining 20% consists of useful substances: cellulose, organic acids (malic, tartaric and citric acid), vitamins A, B1, B3, PP, C, as well as iron, iodine, potassium, calcium , magnesium, sodium, phosphorus, etc. Many have heard that apple fruit is often referred to health – it really is , they contain large amounts of vitamins such as C, B1 , B2, P, E , including manganese and potassium. It is also one of the easily digestible sources of iron . Apples are used not only for the prevention of colds , but also for the treatment of serious illnesses as cancer . A sufficient amount of potassium help to stabilize blood pressure , well, calcium is needed to strengthen tooth enamel and bone . 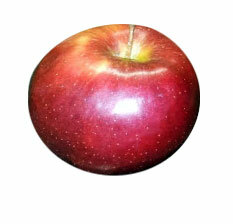 Do not forget that almost apples hypoallergenic and can be used almost for everybody.